In the 1930s, the Veblens began acquiring and consolidating properties along the Princeton ridge on the east side of town, near Herrontown Road. Towards the end of Oswald's life, they donated 82 acres to Mercer County to form the Herrontown Woods preserve in 1957. It was Princeton's first dedicated nature preserve. When Elizabeth Veblen died in 1974, the Veblens' remaining 14 acres, including the Veblen House, were added to the preserve. In 2013, volunteers who would later form the Friends of Herrontown Woods were given permission to clear trails long blocked by fallen trees and invasive growth. 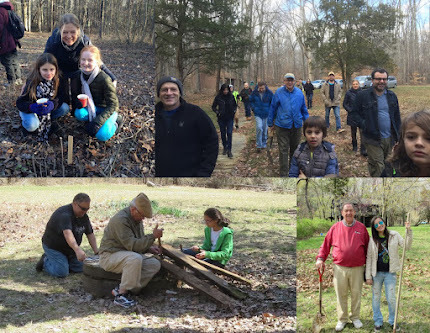 Steady effort ultimately cleared trails on 200 acres of open space in Herrontown Woods and Autumn Hill Reservation, making these beautiful preserves once again welcoming to the public. FOHW is now active in removing invasive shrubs that compete with native species and were obscuring the preserve's natural features. There's a nice writeup on Herrontown Woods at the town website, describing how the Veblen homestead used to be a working farm, and how some of the woodlands were logged in the 1920s. Some trees are 150 years old or more. MAPS: In May, 2015, FOHW made available a brochure with a color-coded map of existing trails, landmarks and access points. Copies are usually available at the kiosk at the main parking lot. A google map, though less up to date, can be accessed through Google Maps at "Herrontown Woods Arboretum". PARKING AND ACCESS: The preserve has a parking lot off of Snowden Lane, down the short street across from the entrance to Smoyer Park. Entrances can be found at this link. FLORA: Because the boulder fields discouraged plowing, Herrontown Woods harbors one of the most diverse populations of flora in Princeton. In the late 1960s, while a PhD student at Rutgers University, Richard J. Kramer researched and wrote a book detailing Herrontown Woods' natural history. Published in 1971 by the Stonybrook-Millstone Watershed Association, a pdf is available at this link. 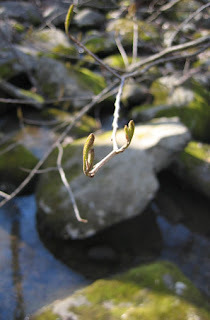 As we've been learning more about Herrontown Woods, we've been adding to the plantlist. GEOLOGY: Located on the Princeton Ridge, Herrontown Woods is dominated by boulders that increase in size as one hikes from the parking lot up towards the top of the ridge. Glaciers did not extend down to Princeton. These boulders are diabase rock--igneous in origin--some of which our board member Jon Johnson discovered to be highly magnetic. 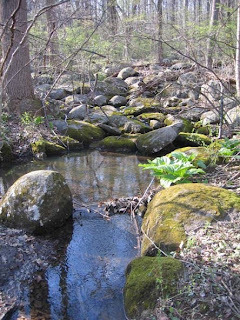 HYDROLOGY: Herrontown Woods contains the only tributary of Harry's Brook whose headwaters are undeveloped. These headwaters are home to salamanders, some species of which may not be found anywhere else along the ridge. 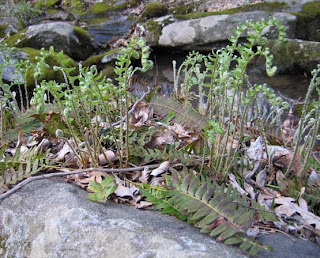 Fiddle heads of Christmas fern perched on boulders.